Welcome to The Horse Show Blog! ED Crothers had trained and started horses for the past 30 years and in the past 12 years has found techniques that shows that 90% of disrespectful horses are in fact in pain. Ed has analyzed and trained approximately 2,500 horses that have had pain issues. Once he has fixed the pain then the training can begin. Have you ever done a show about this? - Verified by Rayne B. Thanks for writng. No, I haven't done a show with Ed. I'd be happy to consider a radio interview. Ed would need to contact me at lambemail@aol.com and express interest. He should explain briefly the topic he'd like to discuss and provide five talking points to get us started. I will make my decision from that. Incidentally, this is a very rich topic. Context is everything. There seem to be two schools of thought on undesirable behavior in horses. One school looks first to physical causes. The other looks first to psychological causes. Both are heavily dependent upon context. Training could created a context in which the horse experiences pain or discomfort and acts on that. By the same token, training or even just routine handling could cause the horse to doubt the leadership of the handler, which creates the psychologial need to push boundaries and behave in a way that is disrespectful and dangerous to the handler. I see more of the latter so I tend to look at the relationship first. When a competent horseman has a foundation of respect and trust with a horse and still encounters undesirable behavior, I think physical causes are absolutely a possibility. This should make for an interesting conversation! This is really interesting Rick - I'd be sure to listen in. I agree that when you have a good bond and foundation and respect and there is a problem there may be a physical cause. I recently saw a lady at the barn with a problem where the horse put it's head down, great rider and handler - it transpired the horse had kissing spines. I would defiantly be interested in this topic. There are too many people that have "problem" horses and believe that they are just being disrespectful or are just not trained well enough, but in fact it was because of the discomfort the horse is in. The horse is telling us something in his behavior, he/she is not comfortable. He does not want you to saddle him because his back hurts or he bucks all the time. The horse is typically telling you that he hurts, get off me. People need to know what to do next, what is the next step, when they experience horses like this. I think this is a topic worth talking about. I think this topic should be discussed for many people to be-able to hear. I have worked with horses sense I was 8 years old in 4-H, open shows and trail riding and I am now 24 and in those years I have my share of problem horses. I now work as a farm hand for Ed Crothers at Cedar Brook Farm. I must say the horses I have seen come here for him to analysis and train. I would never imagine that these horses would be able to be worked with I have seen horses that would not tie, lead, or even put the head down to eat and just in a matter of day some time just under an hour he will have the horse doing things i thought were in possible. because once he has fixed the pain training is possible. one major thing I have learned from watch Ed is that no matter what you do you cant train a horse in pain. One horse that he recently started working with is a horse named Shadow when i seen all the things that horse would not do and how he would act when ask to do them, I thought to my shelf is this horse fix able. once again i was amazed at how much pain issues Shadow had and after 1 day of Ed working with him I see a completely different horse. Now I am not just saying these things because I work for him. Ed could fire me today and I would still stand by his work because I truly believe that what he can do for "disrespectful horses" and their owners would give them the relationship that would not be possible without him. for anyone that reads this i would encourage you to check him out on facebook at Good horse gone bad Ed Crother or on his web page www.TheCrothers.com. Refusing to back, hard to catch, dancing away to escape the saddle, bucking, rearing – these may all be signs of a horse’s misbehavior, or perhaps a less understood cause; pain. With over thirty years of hands-on training thousands of mild to wild horses, equine analyst Ed Crothers, now focuses on identifying their pain. In 2010, he won Reserve Champion at the Extreme Mustang Makeover in Murfreesboro, TN., no small feat with a steed that had never been touched much less performed like a fine tuned instrument. According to Crothers, 90 percent of disrespect in horses comes from pain, while only 10 percent stems from training problems. At his clinics, he strives to educate owners that the majority of horses misbehave not to avoid work but to avoid the pain that work causes. Here are some ways that Crothers recommends to recognize afflicted spots in your horses and ways to fix their discomfort. When you’re working your horse, pay close attention to his body language. How he carries himself is a significant indicator for how he’s feeling. For example, does he move or extend just his neck when he turns to look at something or does he use his entire body? Using his whole body to turn and look at something could indicate neck pain. Other indications of pain are when they bite at you when you tighten their girth, or dance away when you try to mount because being ridden causes even greater discomfort. A horse in pain might also be crabby with other horses in the field since he’s not feeling well. People, as well as horses tend to be defensive when they’re suffering. Flinching when brushed is yet another sign of soreness in the barrel area. If these subtle signs of pain go unchecked, they could morph into bigger problems, which could, in turn, lead to blatant misbehavior issues. For example, if a horse is hurting in a certain spot, he might compensate by using other parts of his body. Eventually this overcompensation will cause the other side to hurt and the isolated pain has now spread to the point that his discomfort is constant and widespread. This dangerous behavior, for instance, might include extreme bucking when you’re riding. If a horse is already suffering in several areas such as his back, hindquarters and neck, when you saddle him and climb on, you’re applying additional pressure to these areas, causing him increased discomfort that he’s going to want to get away from, resorting to bucking, biting, sidestepping, anything to stop the pain. During one of Crothers highly attended clinics, an owner brought a 12-year-old Appaloosa gelding that she’d bought for her daughter to ride in 4-H. Unfortunately, the horse had developed a serious bucking problem when anyone tried to ride him. While watching the horse lunge in a round pen, Crothers soon realized the gelding was suffering in several areas, including his back, neck and hindquarters. His bucking was his way of crying out and trying to get rid of his pain. Crothers made some physical adjustments to the horse and once the horse began chewing and moving its mouth, indicating improved movement and relaxation, the daughter mounted the gelding and both horse and rider seemed content in their newfound pain-free, buck-free ride. Go over your horse every week, and look for sensitive spots in order to identify problems early and get them fixed before they become larger issues. One of the biggest indicators that pain, not attitude, is your horse’s problem is that he expends a great deal of extra energy to get out of work. By nature, horses don’t want to work any harder than they have to. “So, if a horse is going to extreme efforts to get out of work, chances are their actions are driven by pain,” Crothers points out. To check for sore or sensitive areas, run your hand down the base of the neck, on each side of the backbone, and over the hips. Probe him and put light pressure in different spots on the topline. He’ll probably be more than happy to get a massage and enjoy the attention. However, if your horse is really hurting, he is going to try and get away from your pressure. He might also lay his ears back, anything to give you warning that something’s not feeling good. If you become suspicious that your horse might be hurting, it’s time for you to call in the cavalry. Contact either a veterinarian or equine chiropractor to diagnose your horse. Sometimes it’s difficult for these specialists to pinpoint exactly what is causing the pain, so the more information you can provide about your horse’s behavior, the better. Try to be as specific as possible. For example, if a vet asks about the horse’s actions, explain he doesn’t turn to the right. Or, he uses his whole body to look around. In other words, if your horse has difficulty moving a certain way or is sensitive in a particular spot, point that out. Furthermore, once you fix the pain areas, you’re not done yet. Putting your horse through a type of therapy is extremely important to insure that your horse is on the road to full recovery. It’s like having a torn ligament; you still have to undergo therapy to return to normal and horses are no different. According to Crothers, “You’ve got to train their mind and their muscles to get back to where they were before the pain began. You first have to condition your horse’s hurt muscles and build them back from where your horse had avoided using them.” Another key in this process is training the horse’s mind to help him realize he doesn’t ache any more. In his mind he still should hurt if he performs certain actions. It’ll take time and work to make him realize that moving in those ways doesn’t bring on the pain it once did. However, what should you do if you rule out that pain is causing your horse’s disobedience? If pain isn’t the reason, then you do have a training problem. You’ll need to work on the basics and try to figure out what the horse doesn’t understand. 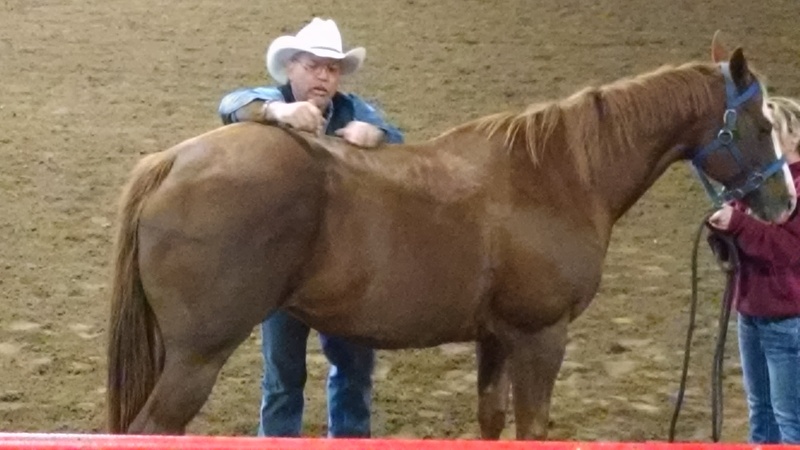 Explaining how to fix the disrespect, Crothers says, “Your biggest key is getting them to trust, relax, listen, and be your friend, while you remain the leader.” During the course of the training, rewarding and the positive reinforcement of petting when your horse performs correctly are vital to the process. Encourage your horse when he does what you want, that’s how he knows he’s pleased you. It’s important to remember that a horse’s misbehavior is often their way of telling us they’re in pain. “If you’re hurting, you want everybody to leave you alone,” Crothers says, “and our horses are trying to tell us the same thing.” Therefore, if your horse is being disrespectful or acting out, don’t be so quick to assume that they’re “being a brat” or “acting crazy” or “Why doesn’t my stupid horse ever listen?” Your horse just might be telling you, “please don’t ride me, it hurts, please don’t push me, just fix it and help me feel better.” In other words, his seemingly blatant misbehaving could be a cry for help. The question is, will you listen? Please do not post articles on my discussion board. sorry i attempted to delete it but was unable, if it needs to be removed please go ahead and take it down, again sorry for the misunderstanding.